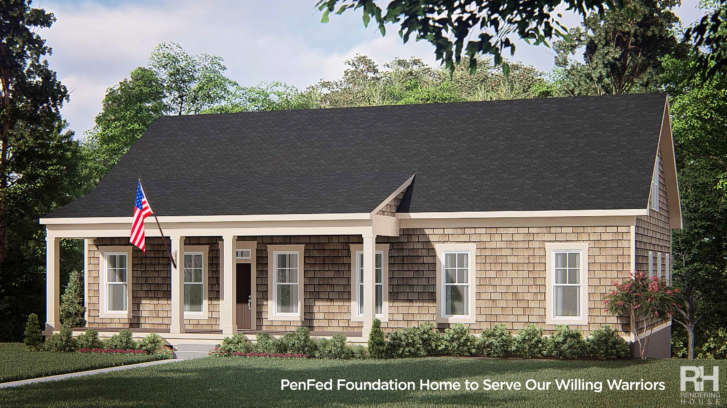 WASHINGTON — A charity that sponsors a country retreat for wounded warriors and their families is doubling its capacity by building a house with a donation from a local credit union’s foundation. The Warrior Retreat at Bull Run in Haymarket, Virginia, is operated by the nonprofit Serve Our Willing Warriors. They received $300,000 from the PenFed Foundation of Alexandria, Virginia, for a new, second house. Going from a hospital to the hills, from a clinical environment to a home accompanied by family, can inspire hope among wounded warriors, whose extended recovery time can rob them of a sense of normalcy. Groundbreaking and a ceremonial check transfer was held Monday on the retreat’s 37-acre campus on the edge of the Bull Run Mountain Conservancy. Schenck said the retreat is a community affair. Boy Scouts mow the lawns and write letters of thanks to the service members; chefs from area restaurants volunteer to cook for the families. The retreat has a long waiting list. The new house will be completed by July 2018. The five-bedroom house will then support a family, caregivers and friends for a week, every week, after that. “We’re very proud to play a small part in spreading the word, and in this case providing funding to make this second home available,” Schenck said on behalf of the PenFed Foundation. PenFed Credit Union started 82 years ago serving the national defense community, but now military service is not required to join.